As soon as you experience the natural luxury of a Beni Ourain rug, chances are you’re forever sold. These carpets are so comfortable and durable, that they are traditionally heirloom products used by many generations. The carpets are handmade of 100% undyed sheep wool. Crafting takes place based on an ancient tradition of Beni Ourain tribes in the North-Moroccan Atlas Mountains. In this rugged region live a special kind of sheep of a smaller breed. Their beautiful, strong wool give the Berber rugs their unique characteristics. 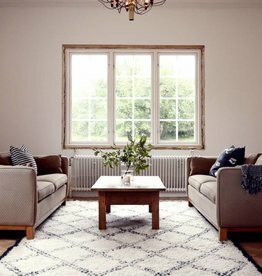 The rugs have a distinct look with their geometric patterns. Often these designs are a reference to aspects of the daily life of the weaver, such as the birth of a child or the beauty of nature. The looks of these carpets makes them suitable for a variety of interiors, such as a modern looking room or a more exotic decor.